Tonight’s passage from the Epistle of James scares the living daylights out of me. Apparently, my tongue is a deadly fire. It stains the whole body. It is a restless evil, full of deadly poison. And as one who speaks to the gathered community, I will be judged with greater strictness for my speech and my actions. I should be quaking in my boots – and believe me, I am. If Biblical commentaries are any guide, this passage from James is often used to preach against gossip: that vicious, and usually female, sharing of stories which can be so toxic. And when this text is preached in this way, the sermon becomes focussed on individual moral improvement – and implicitly condemns the ways women sin. Now, I am a woman who spends a lot of time every day chatting with people about people. There is no doubt in my mind that careless and malicious words can be incredibly destructive – but we all know that. So I’d like to take a step back, and look at the text again. Maybe it’s not just about tongue-wagging and how we need to change our individual ways. Maybe it’s bigger than that. The Epistle of James was written to Jewish Christians. As such, it contains the big themes of Judaism: the importance of neighbourliness; references to the commandments and the law; the prophetic calls to justice; a focus on caring for widows, and orphans, and the poor. It is a letter written to communities which are deeply rooted in Israel’s covenantal way of life. And Israel had a strong tradition of “right speech”. It is so important that it crops up in the commandments, where Moses and the people of Israel are ordered: “You shall not bear false witness against your neighbour” (Exodus 20:16). This emphasis on right speech is not about being a good individual who earns points in heaven for saying and doing the right thing. Instead, like all the commandments and the exhortations of the prophets, it is about building community. Right speech is important to community because, as Walter Brueggemann put it, “real community depends on reliable truth-telling”. Not on saying ‘nice’ things, but on telling the truth, naming the powers, and sharing stories about God. Because this is a twelve minute sermon slot, I won’t detail the ways the church must engage in prophetic truth-telling, challenging the destructive lies that dominate our lives. These themes come up regularly in our sermons, and I think most of us get it! Instead, I will say only this: that meaningful truth-telling emerges from community: from a group of people building each other up in love, listening for the voice of God, and finding ways to speak this truth into every context. But this corporate identity from which truth emerges, this communal wisdom, is not formed out of thin air. And now we come back to the idea of gossip. Gossip is a funny old word. Originally, it referred to a baptismal sponsor: the “sibling in God”, the God-sib: one’s spiritual brother or sister. In the role of sponsor, the God-sib, or gossip, spoke on behalf of the baptismal candidate and vouched for them. You can hear echoes of this word in “gospel”, which comes from the Old English words for “God” and “story”. God-spell. Gospel. So a gospel is a story about God, and a gossip is a sibling in God. Over the years, the meaning of “gossip” shifted and changed. It became feminized; it spread into a verb, or a “doing word”; and it took on nasty overtones. And there is no question that gossip can be harmful and destructive. If James were writing today he might use the phrase “going viral” to describe the contagiousness of thoughtless, vicious or malicious communication; we all know how nasty it can get. And yet gossip can also be incredibly enriching, especially for a church like ours. The original recipients of this letter, like most people of the last two thousand years, lived in small communities. There were no cars, or trains, or bicycles; even horses were out of most people’s reach. People in Christian communities lived within a short walk of each other, and their lives were enmeshed in deep and complex ways. We, however, don’t live in a small village or an enmeshed community. We don’t really know the ins and outs of each other’s lives. Our children don’t go to the same schools; we don’t shop at the same shops; few of our other relationships overlap with our church relationships. Instead, we are highly mobile residents of a big city. We come from all over. We don’t have shared family, clan or even national backgrounds. We had very different upbringings. We eat different foods. In a commuting congregation like ours, it is easy to slip in and out and never form any meaningful relationships within the congregation. So unless we share stories about each other and about ourselves, we cannot know each other. In other words, without gossip, we cannot understand each other’s histories; we cannot forgive each other’s foibles; we cannot form community; we cannot learn to love. For us, gossip done well is the glue that binds us, bringing us together as God-sibs: brothers and sisters in God. It asserts that we care enough about each other to listen to each other’s stories, and to entrust our stories to each other. 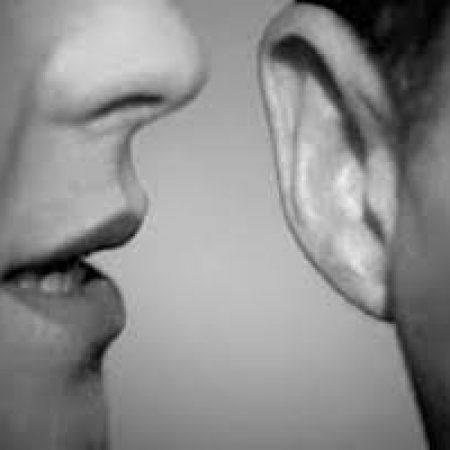 Good gossip helps us develop a sense of solidarity, and a shared identity, as together we look for the fingerprints of God in our lives. One of the biggest temptations for the church – any church – is to look around wistfully, wondering where God is. Most of us suffer from the illusion that God is always more active, and more present, in some other place, at some other time. Yet in our worship we affirm that, in the form of Christ, he ascended into heaven to be everywhere present – and that includes here and now. That ‘here-and-now’ is not God hiding in a cloud, or behind a tree, or in a volcano, or in a special person. It is the here-and-now of the Eucharist, when we recognise in the breaking of bread and the pouring of wine the real presence of Christ in the world, the presence that draws us in and is revealed in us, the gathered community: the body of Christ. When we affirm this presence later in the service, we also implicitly affirm that God is not found in some abstract perfect community of ideal people. Instead, God in Christ is found in the community we are in, right here, right now. But for us to be able to recognise this presence, we do need to form community. And to form community, we need to love one another. To love one another, we need to know one another. And to know one another requires holy gossip. So I invite you to become good gossips, God-sibs, siblings in God. People who tell stories; people who ponder. People who ask themselves good questions about other people’s stories. People who wonder why a story was told, and what it reveals about the storyteller. People who look for God’s action in a narrative, in a life, and in our common life.